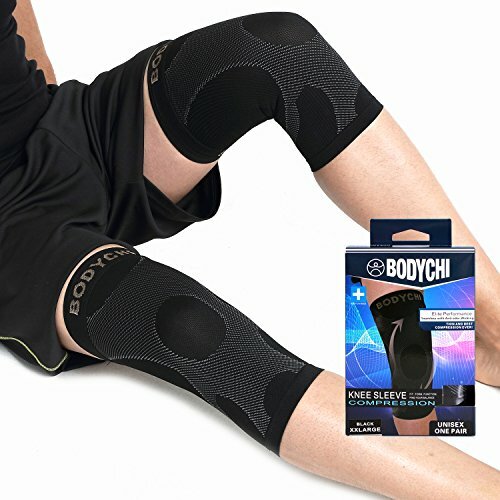 Relieve muscle stiffness and soreness with this compression knee sleeve from BODYCHI. The graduated support helps reducing tissue damage caused from muscle vibration during activity. This support can lead to pain reduction, reduced swelling and inflammation, and can support achy joints. The knee sleeve also has chevron ribbing for enhanced support to the knee area. Protect your body and heal faster with this effective knee sleeve. Aids in recovery by increasing blood circulation and muscle oxygenation while providing relief and support for everyday aches and pains, muscle stiffness and soreness. With comfortable fabric that provides support while allowing you to retain your full range of motion and mobility. If you have any questions about this product by BODYCHI, contact us by completing and submitting the form below. If you are looking for a specif part number, please include it with your message.